Today we take a stand, for real food, for life and for family. Food revolution is an organisation from Jamie Oliver. People tend to see Jamie as that cheeky guy from Essex, the naked chef. What a lot of folks don’t realize is the fact that he actually uses his ‘celebrity chef’ status to do good, to make a change. In 2005 he declared war to the unhealthy British school dinners, in 2010 he took the fight to Amerika. He has built kitchens all over Britain with his Ministry of Food, to learn people how to cook so they can teach others to do so as well. He is passionate about food and people’s relationship with food. Today on 19 May, Food Revolution Day will happen in kitchens, homes and communities around the world. In my case Food Revolution Day will start on my blog and the blogs of a few other lovely Ladies from all over the globe. cook on this day. The dishes will be easy to cook and no processed food is allowed.We can’t be together today ladies, but we are closer together than some people will ever be. Have a wonderful Food Revolution Day! I am preparing Moules et frites, Mussels with real Belgian fries. 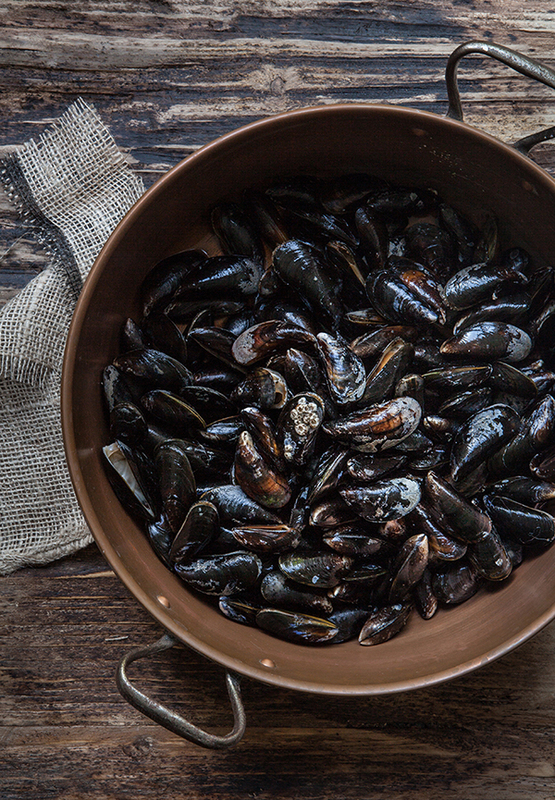 Did you know mussels are an eco-friendly, sustainable seafood choice? Like oysters and clams, mussels actually clean the water they’re grown in. They have no impact on the water because they don’t require treatment against disease. Mussels are also high in protein, zinc, vitamin C, Iron and omega-3 so they are a healthy food choice.It has been said for hundreds of years that mussels are in season in each month that has an ‘R’ in it, but this is an old tale that originated from a time when there was no cooled transport. The fishermen couldn’t get the mussels live and well to their destination. Now the season runs from July until april for the ‘Zeeuwse’ mussels, so I was very lucky to get the last of the catch. 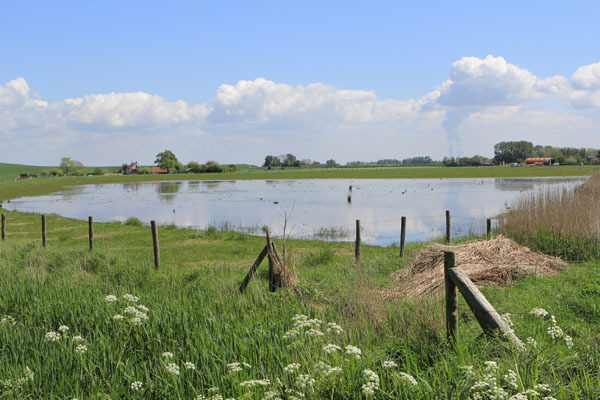 I live just a 15 minute drive from Zeeland, where the ‘Zeeuwse’ mussel happily lives and thrives in the protected waters from the River Schelde.We are going to bake the Belgian fries in the traditional way using ‘Beef tallow’ for frying. The real ‘Frit kot’ (chip shops) in Belgium still uses this Beef tallow -rendered beef fat- and swear by it because it is actually healthier than the vegetable oil that is been used in a lot of places these days. leaving the customer often with stomach and intestinal pains. Also in flavour, the vegetable oil can’t compete with the beef tallow and as for sustainability… beef tallow also wins because its a by-product! So if you want to start eating from nose to tail, beef tallow is the way to go. Just ask your local butcher and I’m sure he’ll be happy to oblige. Select mussels that are tightly closed or that close when you tap them. Discard the ones with cracked shells. Use you nose, they should smell clean and salty, like the sea. Rinse them under running water and don’t be too gentle because you want all the sand to come out. Remove the beards, clean the shells if you need to. Cut your vegetables in small dices and put aside. the ‘allumettes‘ (0,5cm), the ‘mignonettes‘ (0,7cm) and the ‘pont-neuf‘ (1,5-2cm). The ‘mignonettes’ is the one you want for this dish and also the most common.We have to bake the fries twice to get the result we want. If you are using a Frying pan, add the beef tallow to the fryer and set your thermometer to 150°. It’s very important to use the right temperature!Peel you potatoes and rinse them. Cut you potatoes into +/- 0,7 cm discs, don’t be too fussy about the size but do try to keep them all around the same size so they bake evenly. Then cut the discs into fries. Dry them with kitchen paper and leave them on a tray to cool. You can leave them until the rest of your food is ready and fry them a second time just before serving. Add the diced vegetables to a large pot to hold all the mussels, sweat the vegetables and add the water. Leave it to boil a few minutes. Get the temperature of the fat to 190°. Fry the fries in small batches until a beautiful golden color. Before you put the last batch of fries in in the fat, add the mussels to the boiling water, add the lid and shake. Leave for 5 minutes and shake. The mussels should have opened now. Put the lid back on. Turn of the fire. Fry the last batch of fries. 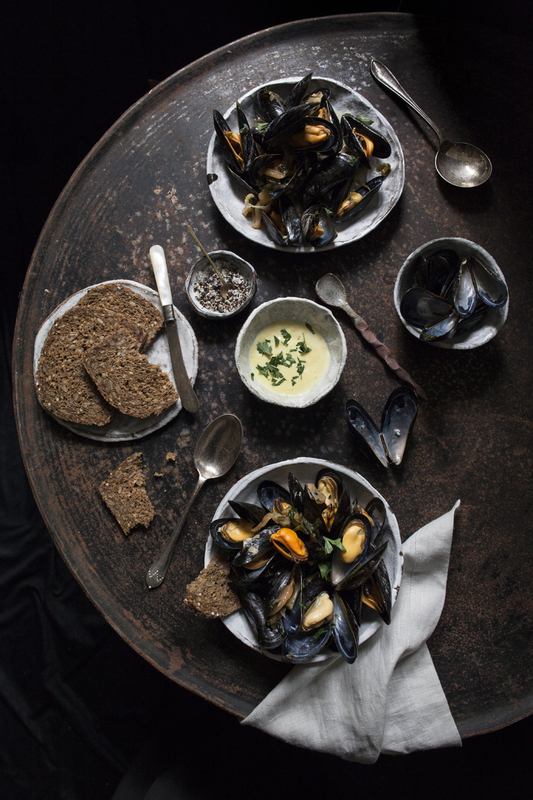 Get some mayonnaise and add 1 teaspoon of mustard and 1 teaspoon of cooking water from the mussels. This is you mussel sauce, traditionally you should also add a bit of vinegar to the sauce. When the fries are ready, sprinkle them with seasalt and serve with the mussels! Delicious with a pint of real ale or a nice glass of dry white wine! *Waste none: the leftover vegetables and cooking water of the mussels makes a delicous tomato soup, just add a tin of skinned tomatoes and a tin of tomato puree and bring to the boil. Puree the soup and bring to the boil again. Want to know how can you contribute to Food Revolution? Fabulous! First of all: start cooking! Home cooked meals are the best! Find out about you local food by asking your butcher, fish monger and vegetable man what’s local and in season. Try and find out if you can buy meat and or vegetables straight from a farm so you reduce your carbon footprint but also by creating awareness about where your food comes from. I will probably mean ordering your meat, veggies and dairy in advance sometimes but this will reduce the trips you usually make to the superstore. By buying straight from the producer you reduce the amount of food that is thrown in the garbage and you also have a hand in the fact that less animals will be killed in vain. I strongly feel that no animal should be slaughtered if it’s not going to be eaten nose to tail. Not just for animal welfare but also for environmental reasons. The carbon footprint of livestock is huge and if we keep up the current way of life, we will one day need to go vegetarian because the earth is just not producing enough food to feed the whole planet. Eat less meat, but good quality meat from local farms instead of intensively reared meat. Happy animals produce better and healthier meat! Please feel free to leave a comment, I love reading them! So happy with our potluck dinner! A fabulous recipe! Eventhough I'm not a mussel fan, I'd give your dish a try as it looks ever so appealing and scrumptious. Do give it a try and let me know! When very fresh they are lovely! Wow! Love this post Regula! Gorgeous pics to begin with and then the food looks so good. Not to mention the importance of foodrevolution ofcourse..;) Love it! Thanks Simone! Food revolution is very important indeed and starts in our very home! You have no idea how much I love the sound of this meal! Especially the Belgian fries… Love the shot you've captured of the mussels and fries too, it really looks like something for entertaining with! So wish this had been a REAL dinner party! But soon….! Soon we will all meet up under the Tuscan sun and eat real delicious food! You girls should come here and I'll cook you up this dish! Ah Regula, this dish is creaming my name! 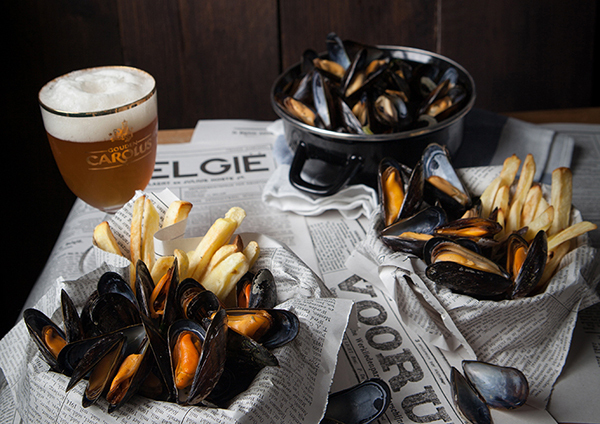 I want to sit at a table and share your REAL Belgian fries and those incredibly fresh looking mussels with all of us. Why this potluck dinner is not real?! Thanks Sari! The mussels were so fresh I could taste the sea! real friends, real food, real fries, too! I'm so eager to taste them, I bet I'd love them, not to mention mussels! Amazing dish for the pot-luck, I love it so much, sweetie pie! I will bring beef tallow to Tuscany for you! I had no idea Belgian fries were done in beef tallow, I thought it was duck fat for some reason. I knew though that saturated fat like beef tallow and lard from pastured animals are definitely better to fry with than vegetable oils. I truly believe that we should stick to traditions sometimes, ancestors knew better! I rarely deep fry but from now on I should really make fries this way, they look amazing! Being Venetian, I love mussels, of course! great main, oh wish we could do it for real! You can fry them in duck fat but it leaves too much of a flavour that's why beef fat is being used. Tradition is best in most of the times. Like, we should always prefer butter to margarine! I love Venice, been there a lot and loved the mussels and vongole there!! 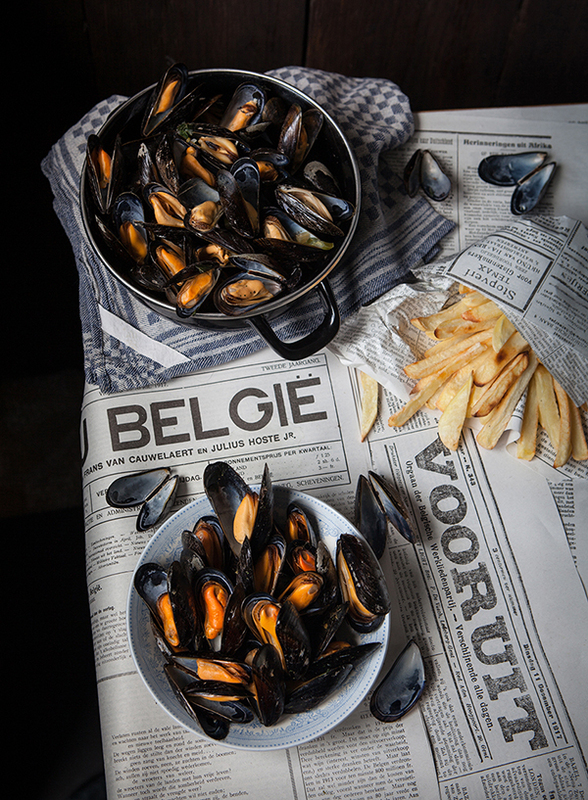 Beautiful mouthwatering pictures of les moules-frites! Gosh I had no idea you could get three different types of chips. And all the time me living with a Frenchman! 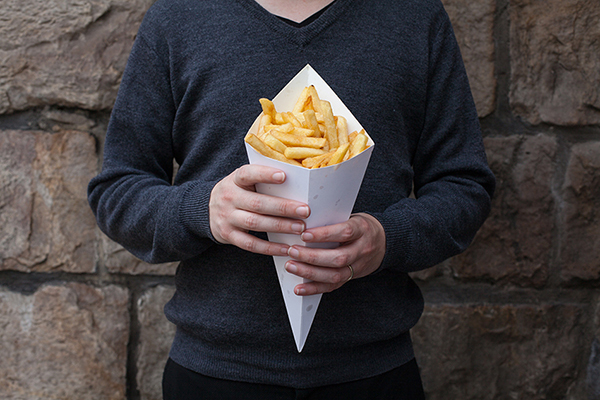 Are the various sizes of chips more traditional in Belgium than in France? Brilliant! I can smell the mussels and the fries through the screen! Too long since I've visited your beautiful site. I'm a huge fan of Jamie's intentions and integrity. Well done for the Food Revolution participation. Your recipe and pics are fabulous. Can anything beat a really well-cooked chip? Jamie Oliver has good intentions and I am 100% behind him! A well cooked chip… there you say it, a well cooked chip is harder than you think isn't it! What a gorgeous meals. My husband and I adore mussels. Just drooling. Thank you for sharing. I found your blog through Jackie, and I'm very glad I stopped by. I hope you have a beautiful day! I hope you had a lovely day too! Regula, I love these pics (and the recipe as well)! Thanks for passing by my blog: by the way, in case you were interested in the recipe you commented, you can find the English translation at the bottom of the page. Jasmine, nice to "meet" you. Lovely. We live in the US, but have family in Morlanwelz. 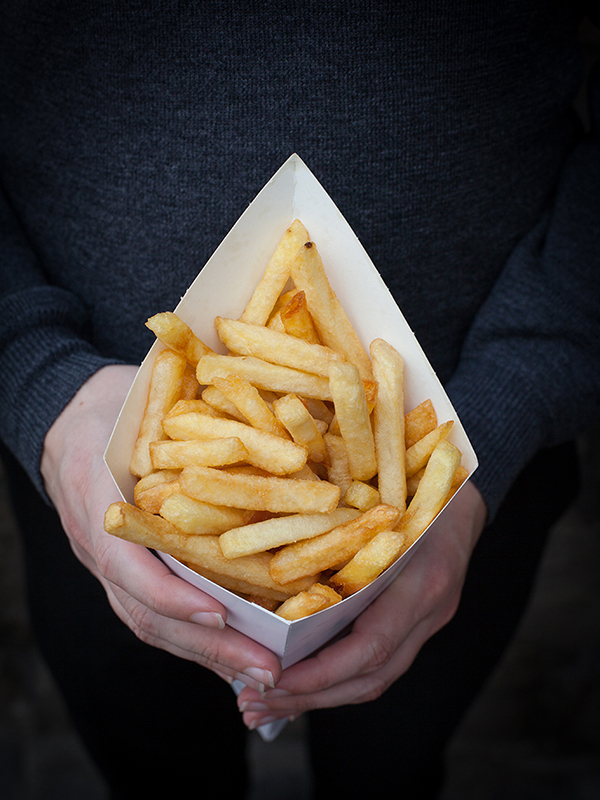 We loved the frites and all of the food of Belgium when we visited last year.